Who Is The Greatest Automotive CEO Of All Time? When GM product Czar Bob Lutz called GM CEO Rick Wagoner the "best CEO I've ever worked for" we did a double-take. Lutz worked for some of the greats, which begs the question: who is the greatest? If it weren't for the audacity and passion (and ego) of Henry Ford II we'd never have been able to place the Ford GT in the fantasy garage. Most CEOs are remembered as much for their failures as their successes, yet Iacocca is more associated with the Dodge Caravan than with the Maserati TC. In modern times, there's no doubting the prowess of a Ghosn. 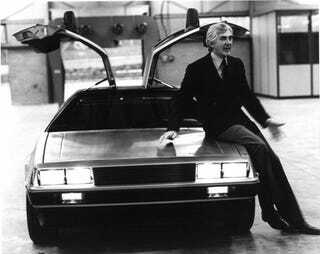 If we have to chose just one we're going to take John DeLorean. Not only was he romantically linked to the likes of Sophia Loren, something we're not expecting to ever see Mulally brag about, he devoted his life to to building the cars we want. A true car guy. While in charge of Pontiac he stuffed a nasty V8 into a "teacher's car" and changed the muscle car market forever. He may be remembered most for the DeLorean and all the failures inherent. It wasn't fast enough. It suffered from quality issues. Those doors were super heavy. It was almost financed with drug money. Whatever, drive a DMC-12 and you'll understand what he was trying to do. He failed. No doubt. Be he tried, which is more than we can say about much of the modern bean-counting leaders. Additionally, he talked the British government into essentially financing huge portions of his operations before he started building cars, making him a pioneer in a trend towards begging governments for help.